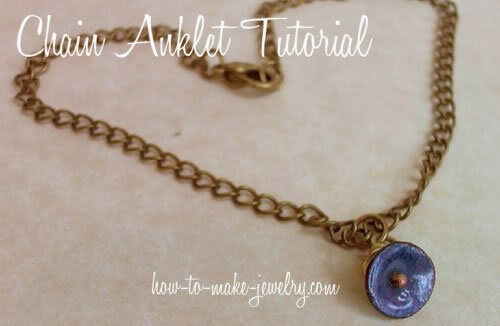 Making a chain anklet is one of the easiest projects ever. Learn how to make your own step by step with this free easy peasy tutorial. 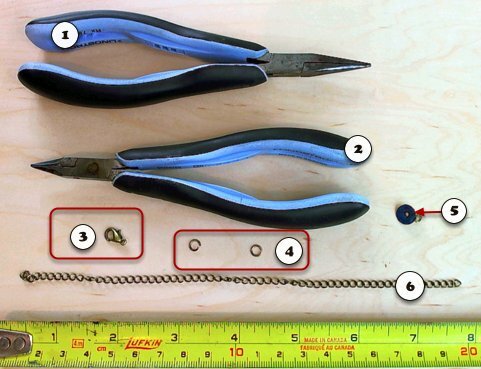 Using your chain nose pliers, open the jump ring and slip the loop through one of the end chain links of your silver chain. Close it back up carefully and be sure to line up both sides of the jump ring so that it is closed securely. Help For Beginners: Learn how to properly open and close a jump ring here (opens in new tab or window). Just slide your charm onto the chain. No trick here :). Remember the #1 rule of carpentry, "measure twice cut once"? 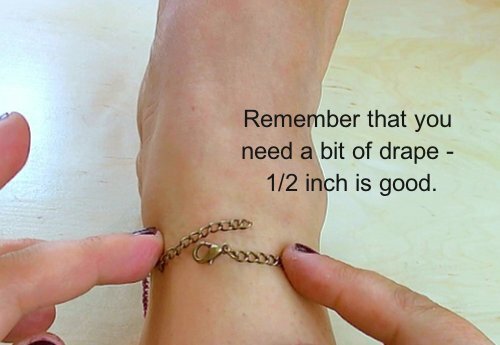 Do a check that your anklet will be long enough to have a little drape before moving on to step 5. 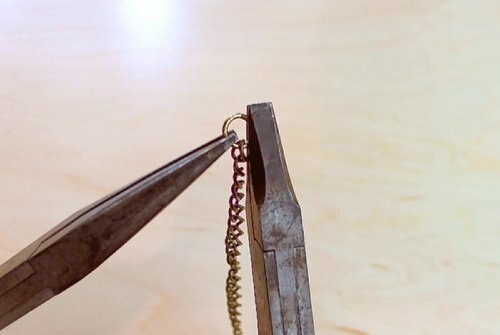 Open your jump ring with the two sets of pliers, slip it through the last link of the unfinished end of the chain, and close the jump ring securely. This step is an advanced final step for extra security. I didn't solder my jump rings closed, but you might want to if you are using an expensive material like sterling silver. If you're going to solder the jump rings closed, be sure to use the proper solder and flux, and a small torch. Plumber's solder or stained glass solder with the little soldering iron doesn't work for this application. What to Solder: (Again, optional). 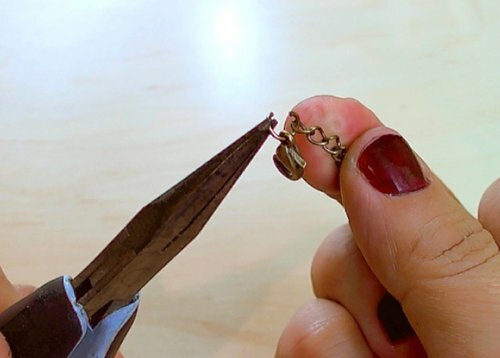 You'll want to solder the lobster clasp jump ring and the lonely 'ol end jump ring closed. This will ensure that the jump rings will never come open. If you aren't soldering them, be sure to use thick enough jump rings so that they don't get pulled out of shape and cause you to lose your beautiful new anklet. Wear Your New Chain Anklet and Enjoy! Dress it up: Use gold or silver chain and gold or silver charms. Or even use a sparkly rhinestone charm or a semi-precious stone instead of something plain for your chain anklet. Keep it Simple: Just use the chain and no dangle. It will still be pretty. Go Crazy: Pile on the charms so that you jingle and sparkle when you walk. (I vote for go crazy). Make it Feathery: Instead of charms, get a pair of feather earrings and remove the feather dangles. 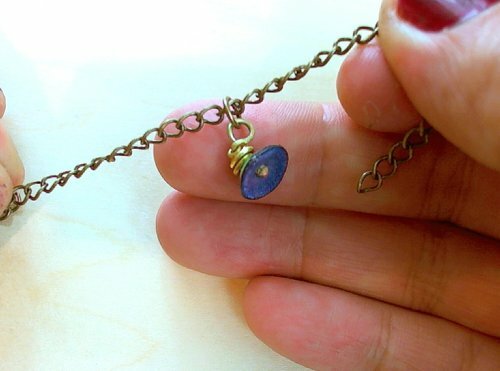 Slide them onto the chain to embellish your new chain anklet. Pretty and floaty.